Whether you have a sharp pain in your ovary or experience dull aching ovaries, any pain in the area can be uncomfortable and a cause for concern. There are a number of causes of ovary pain (1). The ovaries, located in the lower abdomen, serve a number of central purposes for women, and are key parts of the reproductive system. They are responsible for releasing one egg each month that can be fertilized, while also producing hormones such as estrogen, which trigger menstruation. There are multiple causes for ovary pain that vary in severity, discomfort and intensity. Pain can be dull or sharp, can quickly set in or build slowly, or be acute or chronic. It can be the result of cysts, tumors, infections, and more, and sometimes you may even mistake lower abdomen pain for pain in your ovaries. 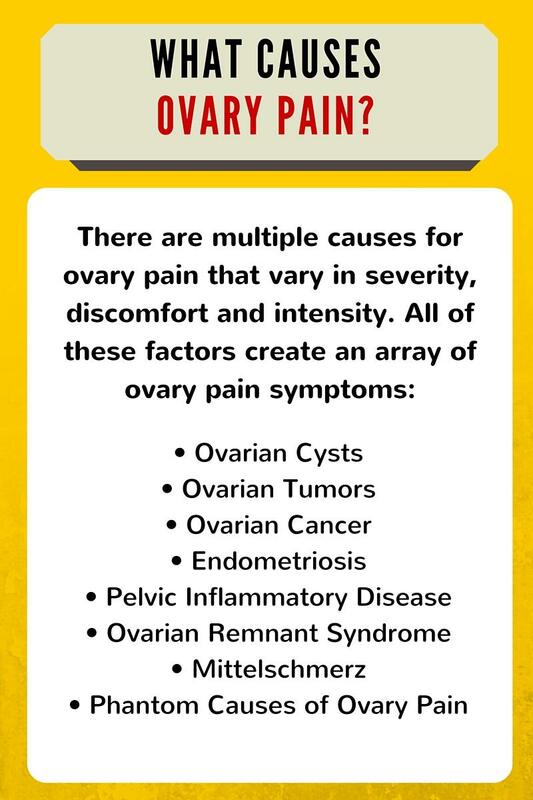 All of these factors create an array of ovary pain symptoms. Ovary pain symptoms are felt in the lower abdomen between your belly button and pelvis. Sometimes you may hardly notice them while other times they can affect your quality of life or create the fear that they might be causes of ovary cancer. Ovary pain might only occur during certain instances, such as during menstruation, going to the bathroom, or exercising. Because ovary pain can be caused by such a wide variety of conditions, it’s advised to get any pelvic pain examined by a doctor. Ovarian cysts can be diagnosed by your doctor through a pelvic exam or ultrasound. Unintended weight loss or weight gain. Ovarian tumors and ovarian cancer can be diagnosed in a few different ways. The best ways to find them are through advanced imaging techniques such as CT scans, MRIs, or PETs. A blood test called a CA-125 can also be conducted, but it’s not a good indicator of whether or not you have ovarian cancer. Ovarian cancer can also be a source of pain in the ovaries. It’s responsible for about three percent of all cancer cases in women, and the Centers for Disease Control and Prevention reports that 90 percent of those who contract it are over 40, with the majority of those over 60. A tumor can be a main cause of ovary pain after menopause, however it may not signify cancer; as mentioned above, it’s possible to have ovarian tumors that are benign. Endometriosis can be diagnosed via ultrasound, MRI, or laparoscopy. Pelvic inflammatory disease can be diagnosed by a pelvic exam, blood tests, urine tests, ultrasound, or laparoscopy. It’s diagnosed using an ultrasound, CT scan, or MRI. Mittelschmerz can be a cause of left ovary pain. It’s a one-sided pain in the lower abdomen that’s caused by a ruptured follicle during ovulation. One of the causes of ovulation pain, this condition can also cause pain in the right ovary. In fact, it can affect either side of your abdomen, affect the same side repeatedly, or move back and forth. This happens during menstruation and can create a sharp pain in the ovaries lasting anywhere from a few minutes to a few hours. It can also appear as a dull pain. The causes of ovary pain are numerous, and are best diagnosed by a doctor—without the proper equipment, it’s very difficult to accurately diagnose the reasons for ovary pain. Regardless of age, type of pain, or when the ovary pain occurs (e.g., during ovulation or afterward), the best thing to do is make an appointment with an obstetrician or gynecologist to get to the root of the problem.